Cream together the butter, margarine, peanut butter, sugar, eggs and vanilla. Sift together the flour, baking soda and salt. Slowly mix the dry ingredients into the creamed ingredients. Cut the cooked bacon into small pieces and blend into the cookie dough. Put the cookie dough in the refrigerator and let it rest for approximately 30 minutes before making the cookies. Mix together 1/2 cup of granulated sugar with ¼ tsp of cinnamon. 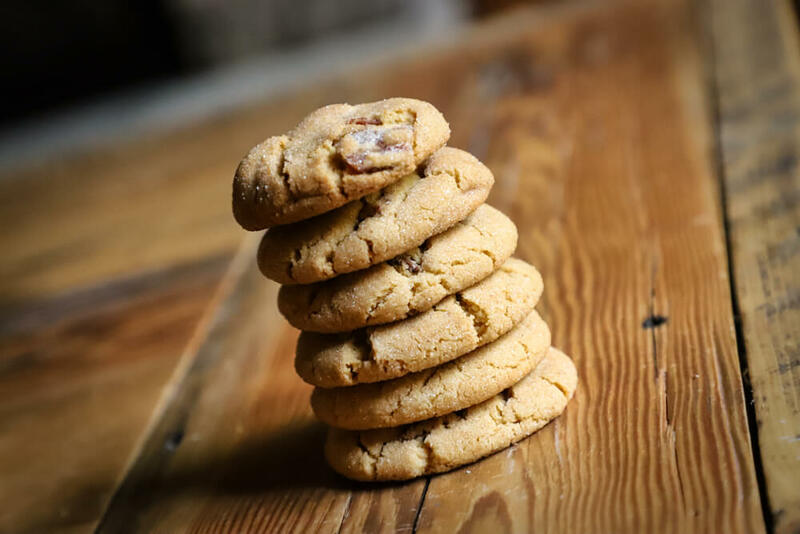 Scoop the cookie dough into small balls, dip the cookies in the cinnamon sugar, place the cookies on a baking sheet and bake at 350 degrees for 11-15 minutes.